Bastian’s Floating Caddis Emerger was originally presented here in January with my announcement that Orvis had added it to their 2013 print and on-line catalog as part of their series of New Patterns for 2013. 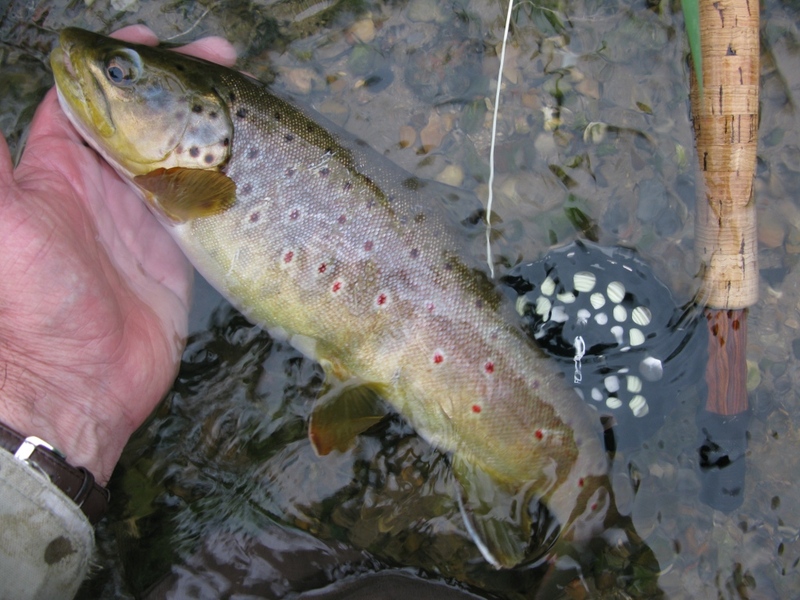 As a caddis emerger, I can’t say enough good things about its effectiveness. 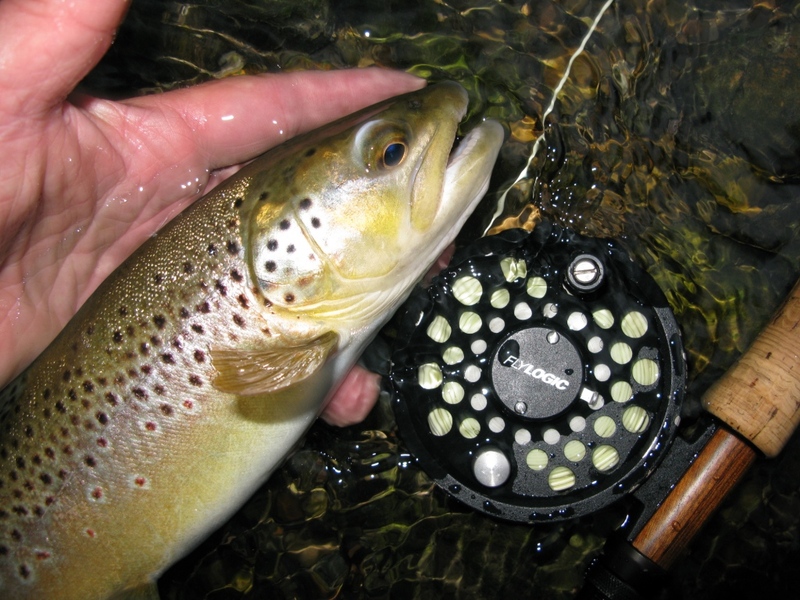 It is effective as designed and intended to be dressed with floatant and fished as a dry fly-emerger, but is also catches trout underwater used with split-shot in a single or two-fly nymph rig. Bastian’s Floating Caddis Emerger can be purchased from Orvis or on a custom-order basis from me. Last year I began to suspect that this pattern might serve double-duty, not only as originally intended as a floating caddis emerger, but also as a floating mayfly emerger, particularly for sulphurs. So one day last year, on May 13th, on Spring Creek in central Pennsylvania, during sulphur time, I tested my theory. 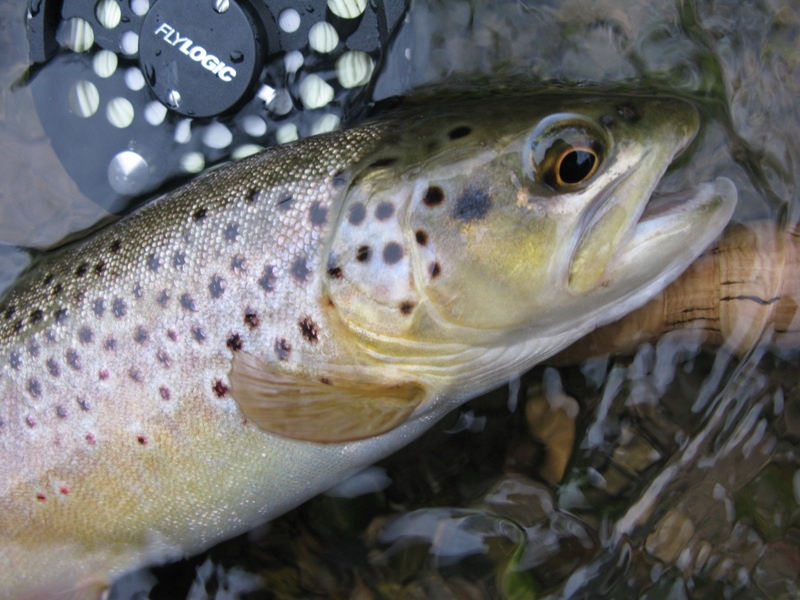 The particular May day last season was on the eve of the On-The-Fly Event on Spruce Creek. 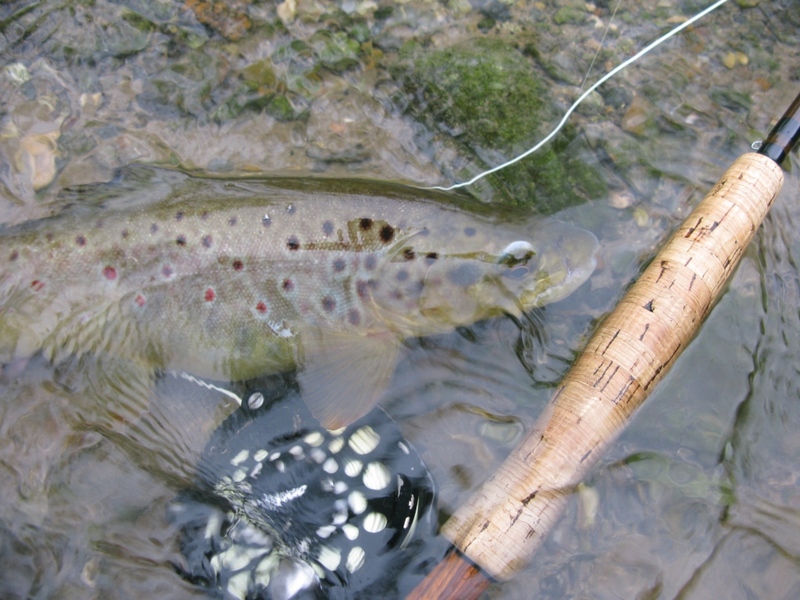 The only change in the pattern from Bastian’s Floating Caddis Emerger, normally in tan, olive, black, and buff, was the change of the body dubbing to ginger Haretron. I have also used regular Hareline #43 Ginger dubbing on the sulphur emerger. This season, just two weeks ago, I also changed the thread color to Danville’s No 7 Orange Flymaster 6/0 for my Floating Sulphur Emerger. Spring Creek brown, the Floating Sulphur Emerger is visible in the fish’s jaw. Another trout. 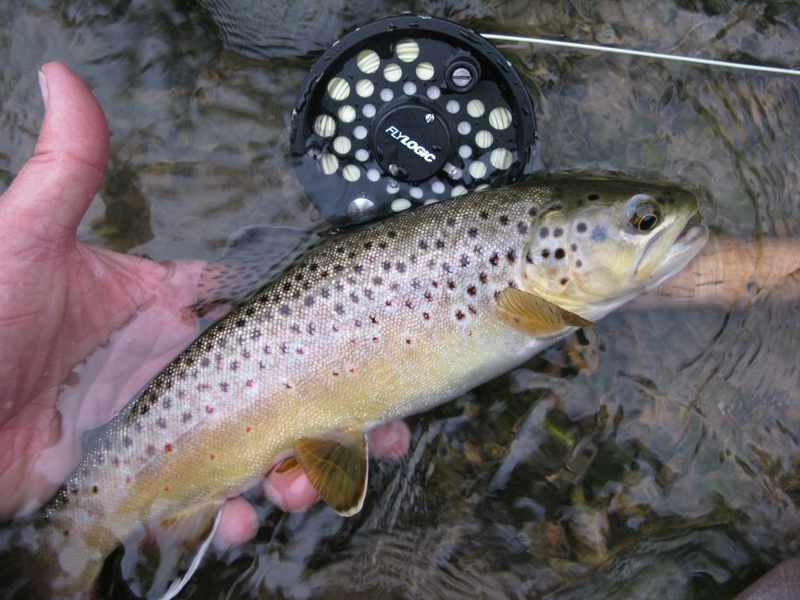 Fourteen trout brought to hand in an hour and twenty minutes is pretty active fishing. They were on the feed on emerging sulphur duns / nymphs. Most of the trout I saw feeding were taking sulphur duns, and I can’t recall a single feeding fish that refused to hit the floating emerger, at least not on that day. 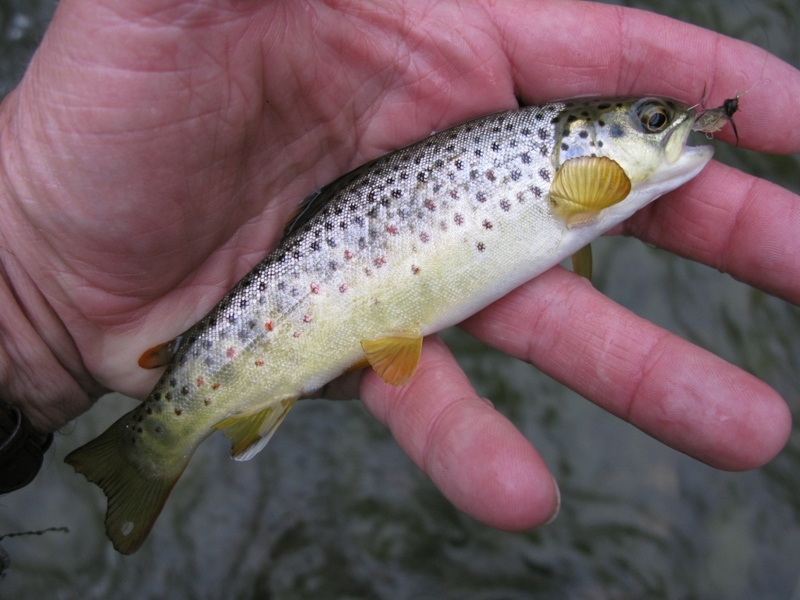 Macro image of trout in previous photo. Little trout are hungry too! 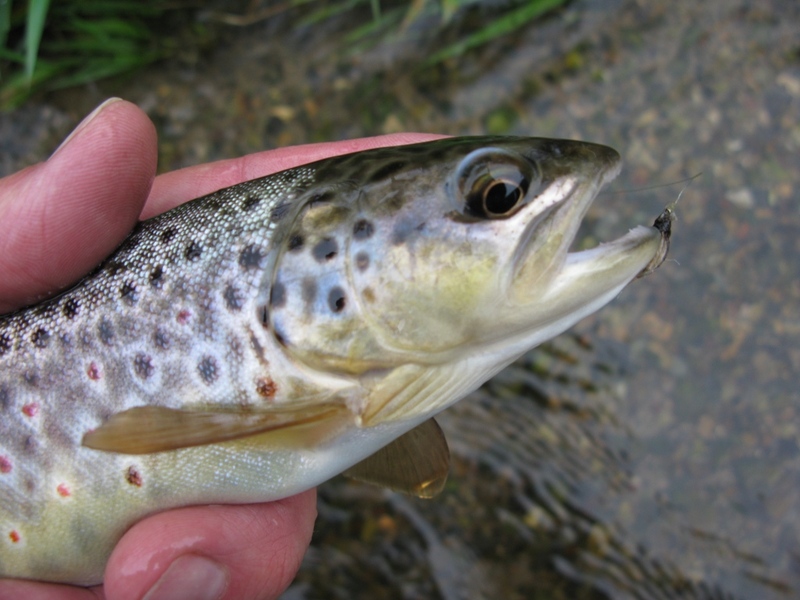 It’s great to catch these small stream-bred fish, it’s a sign of a healthy fishery. 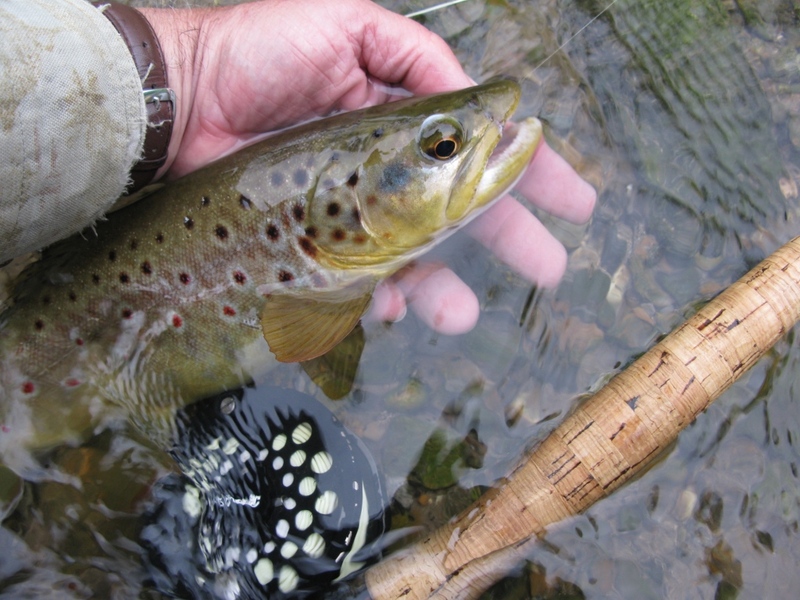 Little trout under catch-and-release regulations, while this section of Spring Creek is no-kill and does not not require barbless hooks, should be protected by pinching all your hook barbs down. It certainly makes for easier release of the fish of any size. Another of the nice trout I landed that day. Same trout as previous photo. I will soon be making a follow-up post to this one, Part II of the Floating Sulphur Emerger, detailing the success of this pattern over four trips on Spring Creek this season. I’ll have tying info and pattern recipes there. Thanks for your interest, hope you enjoyed this article. 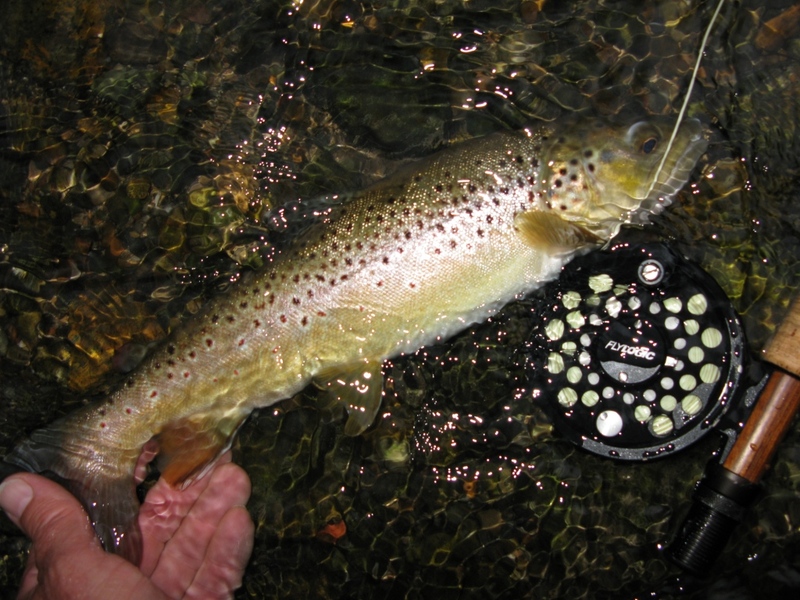 This entry was posted in Dry Flies, Fish Stories and Other Tales, Fishing Photos and tagged Bastian's Floating Caddis Emerger, Bastian's Floating Sulphur Emerger, Spring Creek Pennsylvania. Some beautiful browns Donnie! Miss the Days of fishing Spring Creek sulpurs. Hi Doug! Yeah, when you lived in Dayton you were “Spring Creek Regulars!” Thanks for the comment, and glad you liked the photos! Say hi to Dan for me! Nice to have your validation of the Floating Caddis Emerger! You were in on that pattern’s initial field-testing, Ground-Zero the first day it was fished back in 2006! Took long enough to get that fly “off the ground.” 😉 Thanks for your comment! Don, I see proof that it works, congrats! I would like to see an up close photo of it on this thread though. It sounds like a good one to have in your box, for SURE! You’re funny, and anxious, wanting a macro of this fly. 🙂 I had that in mind…because I know folks would be asking and want this pattern. It does work…quite well, I’m delighted to say. Of course it’s not the end of a quest for the “perfect pattern,” if such a fly actually even exists. That’s what keeps us tying! 😉 It is gratifying when our ideas and experiments produce good results. Thanks for your comments and support! Thanks for your use of my pattern Larry! I also appreciate your comment and input! Thanks!